The summer of 2014 I went for an annual health check up like I do every year. I had my blood test reports read by a Hausarzt who smiled radiantly from ear to ear and said, ‘Alles super, fit und gesund, Frau Muthuraaman…..’. With that attestation from a respected member of the German medical association, my day, month and summer season was off to a good start. I walked out of the Doctor’s room straight to a nearby Patisserie to treat myself to an Erlesene Schokolade Eclair and take home some macroons to share with my family. I felt reassured of my healthy lifestyle. And seven months after that analysis started a few pangs of stomach ache that eventually took me to the Notfall (emergency) section of the Krankenhaus (hospital). The incessant pain and nausea that developed on a Monday morning was something I had not experienced simultaneously ever before, so I declared the inevitable to my husband, Vishaal- ‘take me to the hospital. Now’. A phrase I had last uttered when our second child was ready to arrive in this world. The hospital was ten minutes from our home, but the drive seemed forever. Would I get immediate medical care? Not knowing what to expect or how long it would be before I was helped worsened my predicament. At the Notfall (medical emergency) we were greeted by a large woman in casual clothes. She wore a name badge and an impeccable hairdo (it was hard to ignore her well-set mane – not a strand of hair was out of place – sehr ordentlich eingestellt). Maybe her Friseur (hairdresser) recommended a hairstyle to enhance her image as a firm and solid hospital staff!? Or maybe industrial wax was one of the haircare products she used at home. She took our personal details with the leisure and pace of a receptionist at a five star hotel in a tropical island. I was flitting in and out of a state of semi consciousness, trying hard to keep myself seated upright while clenching in pain. My nausea was intermittent but it was increasing in frequency with every passing minute. Not knowing the reason for my pain worsened my predicament. The serenity of this large woman intensified my pain. Satisfied with our insurance papers she nodded her head and said ‘Nehmen Sie Platz in der Wartezimmer (take a place in the waiting room)’. Wartezimmer? My nausea could make patients in the waiting room nauseous too. Were they prepared for such mass puking? Didn’t emergency medical care mean ‘no waiting’? I mustered the energy to tell her that I was in no position to walk a step further. She glanced at me, gave me a new Behälter (a plastic collapsible bowl to use for further puking) and said very kindly that we could remain seated where we were until the next patient turned up. I thanked God for small mercies and returned to throwing up. About sixteen minutes from the time we walked into the hospital I was shown into a room with a hospital bed. A small batch of what seemed like young doctors-in-training fussed over me. They took preliminary medical details and asked me some investigative questions, most of which my husband answered as it was hard for me to speak through clenched teeth. And then one of these doctors ran her hand up and down my right hand. I was confused. I thought she was examining my skin for some visible signs of sickness until she announced that she was searching for a vein. I wished her luck, when the search seemed like eternity. After a few minutes she said, ‘ah..Ja, gut’ and rammed a needle into my hand. Maybe I was more sensitive to pain in that feeble condition – I don’t know, but the needle in my vein felt like a drill bit driven by a power tool. I yelped, fought back some swear words and calmed myself when this young lady looked me in the eyes and said ‘ uh..Ich muss nochmal…’ What?? She wasn’t successful in finding a vein. So, she wanted to try again. I didn’t have a choice, so she continued to drill different parts of my left and right hand searching in vain, for my vein! Whether she had no luck (or experience) or I had no vein, I could not correctly assess at that point. But hearing me yelp, a doctor took the case of my obscure veins into his hands. He knocked my wrist a couple of times, found a vein (successfully in three seconds) and rammed in a needle that would deliver the painkillers I so badly needed. The ultrasound showed that it was a gallstone stuck in my pancreatic duct. Apparently, a lot of people have gallstones and live peacefully (and unknowingly). But in some cases like mine, the gallstones make an indecorous exit. On a Monday that too. The painkillers worked in a matter of minutes. I was relieved of the pain and nausea, although I still felt weak (from the puke marathon, I guess). I was advised to stay at the hospital until the pancreatic enzyme (Lipase) was brought under control. The Lipase was so dangerously high then that they moved me to the Intensive Care Unit for the night. A good night’s sleep in the care of blond haired, blue eyed, bilingual night-duty doctors in scrubs gave me ample rest. I woke up the next day feeling much better. I saw a food trolley parked outside with stacks of breakfast trays. I readied myself for Frühstück. But the food chappie simply ignored me and went past my room. I gently reminded the Krankenschwester about my breakfast but she solemnly nodded her head from left to right to imply that I was not allowed to eat. I thought a bit and agreed. A little rest to the digestive system could only do me good. By now my husband had relayed the news of my hospitalization to our family in India. My dad and sister had read so much into the topic of gallstones in the pancreatic duct that I was sure between the two of them they could have performed a laproscopic surgery remotely from India. My mother had polled her network of friends and family to understand the lifestyle implications of being (gall) stoned. How did she find these people, I wondered in my drowsiness. Was it a Facebook update or a tweet? a phone call? Whatever it was, my family delivered gallstone related news and tips by the hour. Messages from aunts, cousins and friends from San Jose to Singapore shared their stone stories and get well messages. I was moved. Not just by the messages but also literally, from the ICU to a normal room. From the mass of wires and tubes that kept me pain-and-puke free in the ICU, I was moved to a lovely well lit room with an attached bath about half the size of a football field. Everything in it was remote controlled, the bed, the TV, the lights, the radio, the curtains and even the Krankenschwester. With having to simply lie down and recover – with hubby taking care of kids and home chores – with friends ferrying our kids back and forth from school, I wondered if this was the dream-break-from-chores I sometimes wished for. It was over 48 hours since I had eaten anything. I pressed the red Klingel (bell). I asked the attending nurse, a young man with a Stegosaurus hairstyle, if I could have something to eat as I was hungry. He said the blood reports would come in shortly and then they could give me something. His answer seemed only fair and so I returned to scanning German TV channels. An hour passed, then two more passed and then at around 5 p.m I could smell food in the corridor. I was getting restless. What if the food chappie ignores me this time too? So I pressed the red bell, again. It was same young attendant, again. He opened the door and said he already knew what I was calling for. Apparently my blood tests had improved so he placed a plate containing two (exactly two) Zwiebäcke (rusks). ‘Er..thanks, but when is dinner served?’ I asked him. His eyes fell a bit and said that was my dinner. I held the two Zwiebäcke up to my eyes and looked at him in disbelief. He added that nothing else was erlaubt (allowed) and swiftly shut the door before I could respond. The energy from the Zwiebäcke wouldn’t be enough to move my little finger even once, forget satiating my hunger. So, I called a doctor on duty to understand this. I explained to him that I was always taught to listen to my body and my body was screaming ‘foooooood’. A very pleasant doctor he was, he smiled and suggested that the little or no food would help me recover faster. Really? I had never thought of that. I mean, I was not in a weight loss camp or anything. Couldn’t they give me something more than these rusks? I suggested soup, maybe rice wafers without salt or maybe even some dry bread. All my suggestions were met with the same response – a head movement from left to right and then from right to left to imply, Nein. It was a long night. I couldn’t take my mind off what I was denied. Food. I tuned into the TV channels and saw food ads. I tuned into the radio and heard milk and cheese jingles. I tuned into social media and found friends’ celebrating over food. This can’t be true. What a nightmare! My stomach was making sounds of different decibels. A hungry stomach orchestra. I ate the two rusks and called for more. They brought me exactly two more. I thought of my mum and grand mum who doted on me with fresh home made food after the birth of our daughters. ‘Hospital food is for the sick’ they said and pushed it aside to nourish me with home made food. And now, ironically, I was not even allowed hospital food. I hoped that Wednesday would bring me better food luck. But again it was the same rusks with some fruit tea. But it did bring me good homebound luck. I was to be discharged on Friday! Yahooo, I screamed (thinking of all the dishes I would cook and feed myself). And then the chefarzt informed me that I would need surgery to rid this problem (and my gall bladder). Surgery? I mean I have birthed two children the natural way, couldn’t I push these stones out too, the natural way? Again, my suggestion was met with disapproval. it was turning out to be a worrying Wednesday. A picture can speak a thousand words. And my face expressed another thousand. I had no words or energy to handle this. I threatened the friendly attendants that I was going to have pizza delivered to my bed. They smiled politely but they were trained not be affected by the wry humor of stoned patients. Keen to find an upside to remove my gallbladder – an organ I was born with, I asked the Surgeon the next day if it would qualify me to park at the Behindertenparkplatz (handicapped parking place). That set him and his coterie laughing aloud. With that I was discharged. I guess they were done with my hunger-stricke threats. 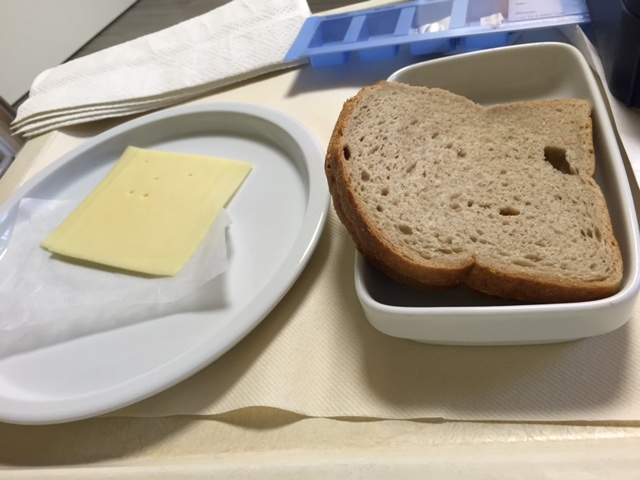 I picked a date the very next week for my surgery – part 2 of my hospitalization – thankfully, it did not consist of zwieback or starvation. I spent almost eight days of February in a hospital bed. At least they can offer some Payback Punkte for frequent patients?